As many of you know, I am very big into fitness and health. I run half marathons, stay active and even worked as a fitness trainer. Due to my love of health and fitness, I often read different blogs, books and social media posts about these topics. One of my favorites is Happy Healthy Hunny, owned by my beautiful and talented friend Ashley Benoit. She not only shares her favorite workout tips and food ideas, but she also helps inspire others to find the person within and make them the best they can be. 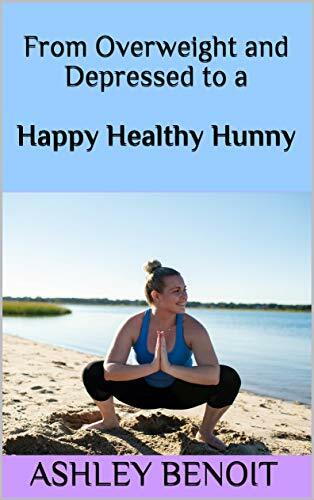 She recently wrote a book about her personal journey called From Overweight and Depressed to a Happy Healthy Hunny.a Ashley gets in depth about her life, struggles and how she overcame it all to become the successful, powerful woman she is today. Below is more information on her book. Go to Amazon.com to purchase. So many of us struggle with our weight AND our mental health. But have you ever stopped to wonder how they’re connected? How has the emotional rollercoaster of life affected your weight and inability to lose it? Or your inability to lose weight in a healthy way? Ashley Benoit shares her journey of realizing just how much her mental health played into her physical health. From being bullied and assaulted, to having unhealthy romantic relationships, to struggling with her self-worth in her career, she shows how her mental and physical health were intertwined every step of the way. After sharing her own story, she then teaches you how you, too, can stop being depressed and overweight and start living your best life! You’ll learn how to: love yourself unconditionally, ditch toxic people and situations, live your life authentically, create a healthy relationship with food, and stop yo-yo dieting once and for all. So, what are you waiting for? Your journey to health and happiness starts here.